Chanteur Rock 'n' Roll US né le 20 Juin 1937 à Fort Smith (Arkansas). Born 20 June 1938 in Fort Smith, Arkansas, USA. 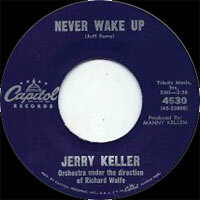 After moving to Tulsa in 1944 Keller formed the Lads Of Note Quartet in the 50s before joining the Tulsa Boy Singers. He won a talent contest organized by band leader Horace Heidt which earned him the Vocalsist job with Jack Dalton’s Orchestra. 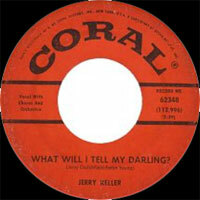 He then spent nine months as a disc jockey in Tulsa before moving to New York in 1956. He recorded a series of demos for record companies before fellow performer Pat Boone introduced him to Marty Mills who became his manager. 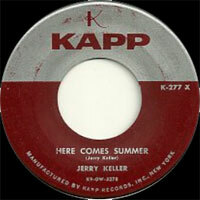 Keller recorded the self-penned ‘Here Comes Summer’ for the Kapp record label, and it became a US summer hit in 1959. Ironically it only entered the UK charts in late August as the warmer months lapsed into autumn, but it still went to number 1. Follow-ups such as ‘If I Had A Girl’, and ‘Now Now Now’ failed to repeat the success. In 1960, he toured the UK replacing Eddie Cochran in a package tour engagement after Cochran had died in a car crash. 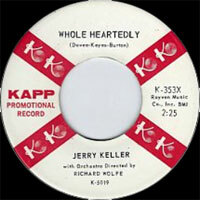 Despite the lack of subsequent hits as a singer, his songs charted handsomely for artists such as Andy Williams and the Cyrkle. In 1977, he appeared in the film You Light Up My Life and the following year in If I Ever See You Again. 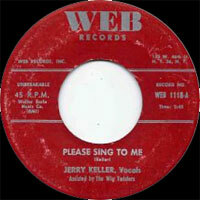 1958 SP WEB WEB 1118 (US) . 11/1958 SP JUBILEE 45-5350 (US) . 04/1959 SP KAPP K-272X (US) . 11/1959 SP KAPP K-310X (US) . 02/1960 SP KAPP K-322X (US) . 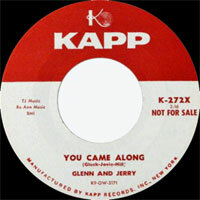 05/1960 SP KAPP K-337X (US) . 09/1960 SP KAPP K-353X (US) . 08/1961 SP CAPITOL 4630 (US) . 11/1961 SP CAPITOL 4668 (US) . 01/1963 SP CORAL 62348 (US) . 05/1963 SP CORAL 62361 (US) . 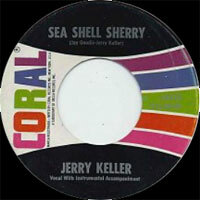 09/1963 SP CORAL 62378 (US) . 02/1964 SP CORAL 62409 (US) . 02/1965 SP REPRISE 0351 (US) . 1965 SP REPRISE 0397 (US) . 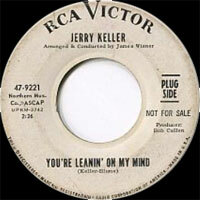 05/1967 SP RCA VICTOR 47-9221 (US) .